If there is one color combination that has been huge this fall, it’s definitely black and camel. This color combination is great because it looks polished and professional in a ‘business look’ and looks fall-ready on any casual weekend look. I realized that I personally have so many black and camel outfit ideas – some of which I ‘ve shared on the blog, and some I haven’t had a chance to, that it only made sense to create a ’round up’ post sharing a bunch of black and camel outfit ideas. I hope this post inspires you to create some great combinations with pieces you already have in your closet. If you want to shop any of the exact items I’m wearing, below each picture I’ve either linked the individual items (if it’s a look I haven’t shared before) or a linked to the blog post on that outfit (which has direct links and has more photos of the look). For a polished work day look, nothing beats a pair of black dress pants and a cashmere camel sweater. (PS. I buy all my cashmere sweaters here – the selection is always amazing!). This camel sweater is unfortunately sold out, but any camel sweater worn with black pants will work. Other great black and camel outfit ideas include pairing a turtleneck, blouse, or sleeveless mock neck top (like I have here) with camel culottes. I like the versatility of this pairing (a black top with camel culottes) because you really can change the vibe of the outfit so easily based on the type of top you pick and how you accessorize it. Also – I realized in almost every one of these looks, I have a black handbag. A quality black handbag is something I think every woman should have a few of in their closet. Here are a bunch of great black handbags under $300. Another take on the first look (camel top, black bottoms) is to go more fitted. Most people tend to shy away from fitted clothing for work, but it actually can look quite professional if you stick with quality fabrics. 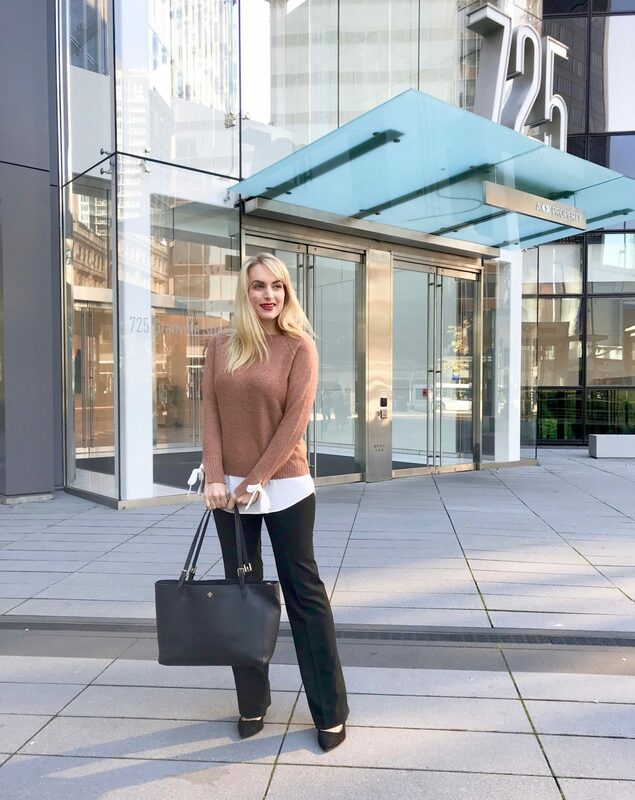 This look was a favorite of mine the past two months – I love the grommet/bead detailing on the sweater, and the tucking a sweater in to show my Gucci dupe belt! This may be cheating when it comes to black and camel outfit ideas since the top is actually white; but the black bow just pops so beautifully that I’m making the executive decision to include it! As the weather gets chillier, a camel coat on top of a classic black dress is such an effortlessly chic look. This is an outfit I’ve worn to the office so many times; and yet I never have that “bored of my outfit” feeling because the look does feel timeless. Last but not least, the first outfit I showed in this post, and actually the most popular post on my blog last month. This outfit is just the perfect fall weekend outfit. I cannot get enough of the combination of black suede boots and camel corduroy. I’ve worn this look a few times, and I’ll probably continue to wear it into winter; just switching out the turtleneck for a thicker, warmer black sweater and a camel beanie instead of a floppy hat! I hope you enjoyed these black & camel outfit ideas and are feeling “fashion-inspired” on this Monday morning! It doesn’t feel like a Monday to me since I am on vacation in Aruba (you can follow along on my instagram stories) but I am sending “short-day-lots-of-delicious-coffee” vibes to all of you at work today :). Have a great one! "The Perfect Dress for Your Fall/Winter Vacation"
Black and camel is my all time favorite this time of year! So chic!! You can never go wrong with black and tan… I’m LOVING the boots with the skirt! Exactly my thoughts! And thank you so much! seriously LOVE camel this time of year and camel and black goes great together. The first outfit is my favorite. One of my favorite color combinations too. It is just so classic. I’m loving all these black and camel outfits!! Great styling, babe! You are absolutely slaying the black turtleneck and camel skirt babe! So so cute! You look perfect! Okay I was already loving the curduroy skirt look and then I saw the fitted camel sweater & skinny black pants…. I’m officially adding camel to my closet! Aw thanks Natalia! So glad I inspired you, yay!